Clubs and axes could surely settle a feud, but they lack a gentleman’s grace and sportsmanship. And a 10-pace draw lacks any sense of parrying. 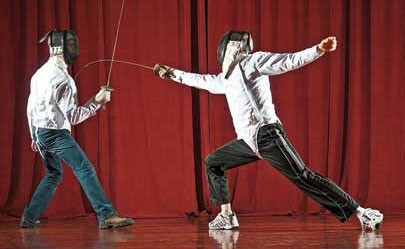 But, ho: Fencing’s games of foil, sabre and épée have stood the test of time—fencing is one of four games to have been included in every Olympic games. 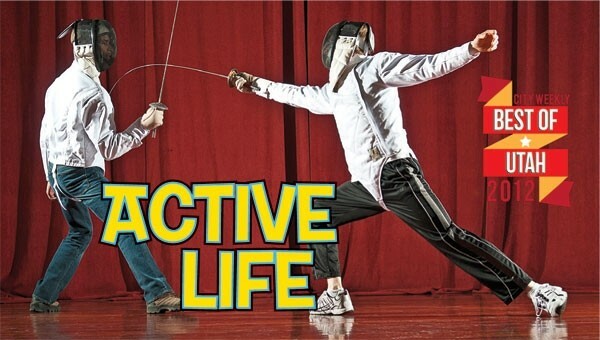 The sport isn’t just for Olympians: The folks at Salt Lake City Fencing can teach the art of swordsmanship and all the fancy footwork needed to end a feud (or just have some fun) with individual or group lessons. 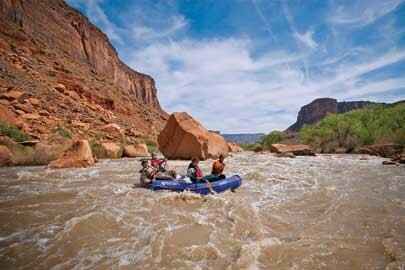 In Moab, there are plenty of river adventures to be had, and plenty of river guides to take the daring down the wild Colorado River. But if you want to experience white-water rafting and all its grandeur without being babysat, you’ll want to trust the competent guides of Red River Adventures. Travelers on Red River’s small boats get to do their own paddling, facing the breaks and waves head-on for single-day and multi-day trips. The guides ensure a safe adventure, but also a fun one—which means you should be ready to get tossed into the drink and really enjoy the Colorado the way it was meant to be enjoyed—by the mouthful. OK, so patrons didn’t exactly get buns of steel at the Utah Museum of Contemporary Art’s Art Fitness Training, but they did get to flex their art-appreciation muscles. The program lasted through three consecutive Saturdays in January. It was all about slowing things down—literally sitting with a piece of contemporary art for upward of 30 minutes—and squelching art anxiety like love-handle blubber during a workout regime. The focus is finding art empowerment, understanding that we already possess art-savvy tools and, of course, the wearing of spandex and headbands. After the SLC Zen Center fizzled out, two of Genpo Roshi’s successors, Diane Musho Hamilton Sensei and Michael Mugaku Zimmerman Sensei, opened the Boulder Mountain Zendo in ArtSpace as a downtown haven for the study of Zen. Students can sit in blissed-out meditation each morning or attend talks and interviews with the teachers. While the center encourages students to sit within their Oriental walls, they also offer teaching methods so students may sit in front of a computer and participate in which include tele-courses, virtual temple days and online koan study. At the risk of setting off a debate on the ethics of keeping wild animals penned up for humans’ enjoyment, consider this a vote of approval for the Hogle Zoo’s impending Rocky Shores exhibit and the arrival of four bears—one polar bear, three grizzlies—that will call it home. Scheduled to open June 1, the Rocky Shores’ 3.5 acres will feature the four bears, along with seals, sea lions, river otters and bald eagles, and will serve as a long-term breeding and conservation facility for polar bears. Here’s betting that Rizzo, the 14-year-old female polar bear, becomes a zoo favorite in no time. Ostensibly, the Utah Undie Run was designed to let the world know that Utah is not quite as uptight as the state’s reputation might indicate. And organizers encouraged runners to mark their bodies with issues they wanted to see addressed by the state's Powers That Be. That might be a more effective strategy if the run were held when those Powers That Be were meeting in session at the Capitol, but it’s probably too cold to run around in one’s skivvies in midwinter. The loop from Gallivan Center around the Capitol and back again was quite a sight to behold Sept. 24, 2011. Another Utah Undie Run is already slated for Aug. 25 this year. You know the maniacs you hear about who jump into icy bodies of water for the sake of bravado and testing their resilience to hypothermia? Yeah, well, they’ve come to Utah, and they want you to become a member. The club uses the event to raise money for relief efforts in Haiti as well as Utah County’s Habitat for Humanity. If you’ve got $35 you want to go to a good cause, and you don’t mind diving into Utah Lake in the middle of January to do it, then it’s time to put your money where your Speedo is and become a Utah Polar Bear. The Central Utah Art Center is Utah’s leading contemporary art gallery, giving a platform for daring artists. Unfortunately for Salt Lake City art lovers, the museum is located 2 1/2 hours south, in Ephraim. That’s where the pARTy bus comes in. The 54-passenger bus picks up passengers from Salt Lake City and Provo and takes them to central Utah. For $15, riders can enjoy drinks and snacks, as well as video art, on the ride, presented by local, national and international artists. Once at the museum, riders get into the art center and can also enjoy a free concert. It costs the same as taking the Wendover fun bus, and you’re not broke when you ride back—if anything, you come back culturally rich.